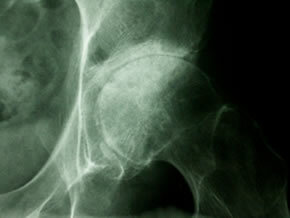 Is Glucosamine Sulfate an Effective Treatment for Osteoarthritis of the Hip? Radiograph showing advanced Osteoarthritis of the hip. Large scale, independent studies of glucosamine and/or chondroitin have not shown a definitive benefit for the treatment of painful knee osteoarthritis (OA) and the effect of retarding knee OA progression remains controversial. Despite this, the use of glucosamine as a complementary/alternative medicine is widespread, amounting to a multi-million dollar industry. Many users take glucosamine for OA at sites other than the knee, sites which have received little to no study of efficacy. Here, Rozendaal et al (Ann Intern Med 2008; 148: 268) report the findings of a randomized clinical trial examining the effect of glucosamine sulfate on hip OA symptoms and radiographic progression. Patients without end-stage hip OA were randomized on a 1:1 basis to receive glucosamine sulfate (750 mg twice a day; manufacturer Nutricia) or identical placebo in a double blind fashion for 2 years. Outcomes included pain and function measured using the Western Ontario and McMaster (WOMAC) Osteoarthritis Index subscales, 24-month progression of joint space narrowing in the most symptomatic hip, and use of pain medications. Minimally clinically important changes were set at 10 point differences in WOMAC scales and a change in joint space narrowing of 2.5 mm over 24 months. 222 patients were randomized equally to each group, of whom 207 (93%) completed the trial. Drop-outs were equal between groups. Adherence to therapy was high (>80%). Women comprised 69% of subjects with a mean age of 63 years. The majority of patients reported disease of > 3 years duration. Baseline minimum joint space narrowing and WOMAC scores were balanced between groups. Approximately half of patients had mild radiographic OA (Kellgren-Lawrence grade of 1). Twenty patients underwent total hip replacement during the course of the trial (7 in the placebo group and 13 in the active treatment group). There were no statistical or clinically important differences between glucosamine and placebo in any of the primary outcomes (WOMAC pain, function, or radiographic progression) over the 24 months of the trial. Neither were there statistical differences in secondary outcomes (stiffness, pain (VAS)). These differences did not change when corrected for adherence or for other potential confounders. There were no significant differences in the occurrence of adverse events between the two groups. Glucosamine sulfate was not efficacious in treating the symptoms or retarding radiographic progression of hip OA over two years of use. Large, randomized trials of glucosamine that lack pharmaceutical sponsorship have largely shown no effect of glucosamine for analgesia or structural modification in knee OA. One of the criticisms of the landmark GAIT trial in knee OA was that glucosamine HCL was used instead of glucosamine sulfate. Yet here, this difference appears to be irrelevant. One criticism of the trial presented here is that a large number of patients with mild radiographic disease were included. However, all patients were symptomatic, with baseline WOMAC pain and function scores consistent with other trials, and since the objective was to investigate radiographic progression, one would still expect patients with even mild radiographic OA to demonstrate differences in progression rates if there was a beneficial effect of the drug. Should hip OA patients who have derived subjective benefit from glucosamine stop the drug based on these results? Probably not, although frequent reappraisal of whether its use is helpful is advised. There appears to be little downside regarding toxicity for continuing the drug. However, taking a drug with little or no effect for a prolonged period of time may have a detrimental effect on the pocketbook. Knee pain from osteoarthritis (OA) tends to be poorly correlated to degree of cartilage loss. Other factors related to knee OA, including bone marrow edema and synovitis, may be more proximal determinants of pain in knee OA. Synovitis is usually quite limited in knee OA and difficult to quantify on physical exam. Magnetic resonance (MR) imaging is a more sensitive technique for assessing synovitis in knee OA. Here, Hill et al (Ann Rheum Dis 2007; 66: 1599) explore changes in knee pain according to changes in knee structures, including synovitis, in participants in the Boson Osteoarthritis of the Knee Study. The Boston Osteoarthritis of the Knee Study is a prospective cohort study investigating the natural history of symptomatic knee OA. MR assessment, performed at baseline and repeated after 15 and 30 months, was evaluated for cartilage morphology and synovial thickening. The association between change in synovitis scores with reported knee symptoms and cartilage loss were explored using the generalized estimating equation (GEE) method. A total of 270 participants (59% male) with a mean age of approximately 67 years had at least one follow-up MR study. At baseline, the median Kellgren-Lawrence grade (a measure of severity of joint space narrowing and osteophytes) was 3, indicating moderate multiple osteophytes, definite narrowing of joints space, some sclerosis and possible deformity of bone contour in most patients. Mean pain score at baseline was 44.2 mm on a 100 mm scale, and decreased slightly, on average, at follow-up. Synovitis was present in approximately 75% of patients at baseline, with most graded as 1 on a semi-quantitative scale ranging Baseline synovitis did not correlate with baseline pain score (r=0.09). However, change in synovitis was moderately correlated with change in pain (r=0.21, p=0.0003). The association between change in synovitis and change in pain was greatest for synovitis located at the infrapatellar and intercondylar fat pads. Cartilage loss was detected in half of patients at follow-up; however, change in synovitis was not significantly associated with change in cartilage at any site. Changes in knee synovitis were associated with changes in knee pain, but not to changes in cartilage loss, in patients with painful knee OA. These are interesting findings that suggest that pain control in knee OA should include the treatment of synovitis, and provide some support for the analgesic benefits derived from intra-articular injections of corticosteroids and, more recently, biologics. Knee pain in OA is complex and multifactorial, with a combination of structural pathology interacting with pain perception/neurobehavioral pathways resulting in patient assessed symptoms. For this study, no consideration of extra-articular confounders, such as analgesic medication use or depression, was made—factors which could alter the associations observed either in a positive or negative way. Regardless, the findings are compelling and suggest that a follow-up study employing a controlled effective intervention (i.e. injected corticosteroids) should be performed to validate the association. Pain perception in osteoarthritis (OA) is complex, with the intensity of pain reported in affected individuals often with little correlation to structural damage. Few studies have explored the neural networks responsible for processing pain in OA. Here, Kulkarni et al (Arthritis Rheum 2007; 56(4):1345) use functional positron emission tomography (PET) scanning to investigate the structures of the brain involved in pain processing in patients with knee OA. Subjects discontinued analgesics at least 12 hours prior to testing and were asked to not engage in unaccustomed physical activities prior to undergoing pain-free and experimental pain testing. 12 subjects (50% female, mean age 59 years, knee OA evenly split between right and left knee as the predominant symptomatic knee) underwent PET scanning. Group means for depression, anxiety, and catastrophizing scores did not change over the course of testing. Pain ratings (on a 100 mm scale) were low during pain-free testing (mean rating 4 ± 10) and elevated during both arthritic and experimental pain testing (mean rating 62.9 ± 11.4 and 62.4 ± 15.3, respectively), but did not significantly differ between arthritic and experimental pain testing. Despite similar pain ratings, significant differences in location of brain metabolic activity were detected between the three testing conditions. Compared to pain-free testing, arthritic pain showed significant enhancement in all pain areas of the brain with activation bilaterally, including the area of the areas responsible for processing emotional and affective responses to pain (cingulate cortex), aversion conditioning and fear processing (amygdala), and attention (prefrontal and posterior parietal cortices). Both experimental pain and arthritic pain activated the same regions, although arthritic pain was associated with greater activation of the medial pain system (associated with emotion and fear) and the primary motor cortex, a finding possibly related to inhibition of the desire to move the leg with arthritic pain. Pain from knee OA and experimental pain are both processed in brain areas associated with mood, emotions, and fear. However, OA pain was associated with greater activation in these areas. The pain response in OA may be mediated as much by pain processing mechanisms in the brain as structural damage. These data suggest that the pain response in OA goes beyond the mere localization of sensations, but reaches deep into the emotional centers of the brain. Studies involving functional brain imaging may identify areas of the brain that may be targets for novel therapeutic agents, as treatment of both emotional and physical pain may be needed to alleviate the symptoms of painful knee OA in some patients. Exercise may decrease the risk of developing knee osteoarthritis (OA) via trophic effects on cartilage and muscle strengthening. However, exercise may also predispose to knee OA via joint loading and the potential for traumatic injury. These predisposing factors may be more important in individuals who are overweight or obese. Here, Felson et al (Arthritis Care & Research 2007; 57(1): 6) investigate the relationship between self-reported recreational exercise and the development of knee OA. Participants in the Framingham Offspring Study, a cohort study investigating the inheritance of OA, without baseline knee OA underwent knee radiography and were asked questions about habitual exercise. Knee radiography was repeated 1 to 2 years later when subjects were asked questions about interim knee injury. Radiographs were evaluated for development of knee OA (defined as progression to a Kellgren/Lawrence (K/L) grade of 2 or higher with or without incident symptoms), the development of patellofemoral OA, and progressive joints space loss. 1,279 subjects (of which 2,259 knees were eligible) had complete radiographs with an average of 8.8 years between examinations. 56% of subjects were women with a mean age at baseline of 53 years and a mean BMI of 27.4 kg/m2. 26% of subjects reported knee pain at baseline. 215 knees (9.5%) developed incident knee OA, most knees with incident knee OA were symptomatic (80.4%), and most showed OA in the tibiofemoral compartment (84.1%). Walking for Exercise Regular walking for exercise was reported in 48% of subjects. There was no difference (risk or benefit) in incident OA for those walking more or less than 6 miles per week compared to those reporting no regular walking for exercise. The risk did not differ in analyses stratified by median body mass index (BMI). Although a small percentage of subjects reported regular jogging or running, there was not a significant risk or protective effect associated with these activities. Relative Physical Activity There was no significant difference in incident OA between subjects reporting higher or lower activity levels compared to peers compared to those reporting similar activity levels. Again, there remained no significant differences in analyses stratified by BMI. Self-reported habitual physical activity was not associated, either positively or negatively, with incident radiographic or symptomatic knee OA. BMI level did not modify the lack of association. These are interesting findings that suggest that while habitual exercise does not increase the risk of knee OA, it may also not hinder its development. There are several limitations to the study that may limit the validity of these interpretations. For one, regular exercise was assessed by patient self-report from a handful of general questions. Second, the impact of exercise may depend more on how it is performed than merely on if it is done. While the effect of BMI was investigated, there is no additional information on how the activities may load the knee or may promote muscle strengthening. Despite these qualifications, the study has the advantage of a large sample size and longitudinal follow-up, even though 1 to 2 years may be insufficient to see radiographic changes. Longer term follow-up is warranted to track the effect of physical activity on incident knee OA in this population. The study was conducted at 42 centers in North America (NA) and 44 centers in Europe (EU). Men and women age 40 to 80 years with symptomatic knee OA in the medial compartment (at least 1 osteophyte and 2-4 mm of joint space width (JSW)) were randomized in a double-blind fashion to receive risedronate 5 mg/day, 15 mg/day, 35 mg/week (Europe), 50 mg/week (North America), or placebo for 2 years. The knee with the narrowest JSW was designated as the “signal” knee. Background analgesics and NSAIDs were allowed throughout, but washed out in a prespecified manner prior to follow-up visits occurring at 6, 12, and 24 months after enrollment. Outcome domains included symptoms (measured with the WOMAC questionnaire), radiographic progression, and biochemical markers of cartilage breakdown (urine N-terminal crosslinked telopeptide of type I collagen (NTX-I) and urine C-terminal crosslinked telopeptide of type II collagen (CTX-II)). Safety assessments were conducted every 3 months. Of the 9,236 subjects screened, 2,483 were randomized with approximately equal proportions of subjects in the EU and NA cohorts. Three-quarters of the subjects completed the entire 2 years of the study, although an additional 11% of subjects who discontinued study drug before two years returned for the final 2 year follow-up radiographic assessment. Subjects tender to be older (around 60 vs. 63 years of age in the NA vs. EU cohorts, respectively) and female (61% vs. 79% in the NA vs. UE cohorts, respectively). WOMAC scores were slightly higher in the EU group compared to the NA group (45.8 vs 40.2, respectively). Compared to EU subjects, NA subjects had higher BMI, more use of estrogen/SERMs, and more use of analgesics and NSAIDs. However, subject characteristics were balanced within cohorts. All groups had a 20% or greater reduction in WOMAC total and subscores, including the placebo group. There were no significant differences in treatment effect between the placebo group and any dose of risedronate in either the NA or EU cohorts. Overall, 13% of subjects had radiographic progression of JSW narrowing > 6mm in the medial compartment at 2 years. There were no significant differences in the proportion of radiographic progressors between the placebo and any dose of risedronate groups. Similarly, the proportion of subjects with increases in osteophyte size did not differ between any of the treatment groups and placebo. Increases in biomarkers of cartilage degradation (NTX-I and CTX-II) were noted in the placebo group in both cohorts, while dose dependent reductions in these markers were associated with risedronate treatment. These differences were significantly different from the placebo group and were noted as early as six months. No significant differences in safety were noted between placebo and any of the risedronate groups, including GI symptoms in patients with and without concomitant NSAID use. Risedronate therapy was not superior to placebo in altering the symptoms or delaying radiographic progression of symptomatic medial compartment knee OA, despite the observation of significant dose-dependent improvements in biochemical markers of cartilage degradation. This is an interesting study in that it is definitively negative for its primary clinical and radiographic endpoints. The findings with the biochemical markers of cartilage breakdown are interesting and, at best, suggest that further investigation into the mechanisms of risedronate on cartilage are warranted. However, they by themselves do not suggest a role for risedronate in treating or preventing knee OA in clinical practice. The discrepancies with the animal studies are interesting, but not inconsistent with the discrepancies in studies of other agents in knee OA. A common theme in these studies is the power of the placebo response and the multifactorial nature of pain in this disease that makes detecting valid treatment effects particularly challenging. Considering a large, well designed, carefully executed study such as this one, we are reminded that underpowered, uncontrolled OA studies are more likely to mislead rather than enlighten. The reasoning behind using a bone protective agent to prevent cartilage degradation is not intuitive. Recently, investigators have suggested that pain and the early pathology of OA occurs in the subchondral bone, with so-called “bone-edema”, rather than first in the articular cartilage. This concept has been insightfully argued but not definitively proven. For this reason, use of a bone protective agent makes sense. However, whether these agents can affect disease that is already established or whether subchondral bone is a location that is amenable to bone protection by bisphosphonates are two of many possible reasons to explain the lack of treatment effect observed in this study. Is There an Association Between Knee Height and the Prevalence of Knee Pain? Mechanical forces exerted on the knee contribute to the development of knee osteoarthritis (OA). Among these, the additional torque about the knee associated with increasing leg length may predispose people of taller stature to knee OA. However, this association has received little prior investigation. In contrast to body height, which may decrease with age, knee height is relatively constant, making knee height a more appropriate surrogate for stature in the elderly. Here, Hunter et al (Arthritis Rheum 2005;52(5):1418) investigate the association of knee height to the prevalence of knee pain and/or radiographic knee OA in an elderly population. Assessment for radiographic knee OA bilateral weight-bearing fully extended knee radiographs for tibiofemoral OA and skyline radiographs for patellofemoral OA. Tibiofemoral knee OA was defined as K/L grade > 2. Patellofemoral OA was defined as either > 1 osteophyte or joint space narrowing on skyline views. 1006 men and 1500 women were enrolled with a mean age of 68 years (men) and 67 years (women). Mean body mass index (BMI) was 25.3 for men and 26.0 for women. Men in the highest quartile of knee height (mean knee height 52.5 cm) were significantly more likely to demonstrate patellofemoral and tibiofemoral OA than men in the lowest quartile of knee height (patellofemoral: OR 1.4(95% CI 1.1-1.8); p for trend = 0.002, tibiofemoral: OR 1.3 (95% CI 1.0-1.6; p for trend = 0.031). However, increasing knee height was not significantly associated with symptomatic knee OA in men. In women, the association of knee height and radiographic OA was stronger than in men. Women in the highest quartile of knee height (mean knee height 48.2 cm) were significantly more likely to demonstrate patellofemoral and tibiofemoral OA than women in the lowest quartile of knee height (patellofemoral: OR 1.7(95% CI 1.5-2.0); p for trend = <0.0001, tibiofemoral: OR 1.7 (95% CI 1.5-2.0; p for trend = <0.0001). In contrast to men, increasing knee height was significantly associated with symptomatic knee OA in women, with women in the highest quartile of knee height demonstrating a 2.2 fold greater odds of symptomatic knee OA than women in the lowest quartile of knee height. Similar results were obtained when knee height as a proportion of body height was utilized. In women without radiographic OA, increasing knee height was associated with increasing knee pain (OR 1.8 (95% CI 1.3-2.5) for the comparison of highest to lowest quartile of knee height. No significant association between increasing knee height and knee pain was found in men without radiographic OA. Conclusions: Among elderly Chinese men and women, increasing knee height is associated with prevalent tibiofemoral and patellofemoral OA. In addition, increasing knee height is associated with prevalent symptomatic knee OA and knee pain with no radiographic evidence of OA in Chinese women. Editorial Comment: This study is one of the first to confirm an association between taller stature and knee OA. Because the association is somewhat modest, a large sample size was required to detect differences between patients of different knee heights. In addition, as with any cross-sectional investigation, these findings fall short of proving any causal relationship between knee height and the development of knee OA. A longitudinal study is certainly appropriate to further examine the risk of taller stature on the development of OA, particularly as significant gender differences were seen here. In particular, the factors contributing to increased knee pain and symptomatic knee OA in taller women but not in men require further exploration, as the men in the cohort presumably had longer tibia and femur lengths than the women and thus would be expected to have much greater torque about the knee. Chinese men and women have been shown to have a greater prevalence of knee OA than other ethnic groups. Cultural differences in stooping, kneeling, and portage may explain these difference and may disproportionately affect those of taller stature. Thus, the generalizability of these findings may not necessarily apply to other populations. Nevertheless, the results are compelling and contribute to the current understanding of the mechanics of knee OA.